San Francisco enjoys laudably high recycling and composting rates as part of a campaign to achieve an aggressive zero waste goal. (Image: TreeHugger). Have you seen the documentary ‘Racing To Zero’ yet? It spotlights San Francisco’s efforts to achieve an aggressive Zero Waste goal of diverting 90% of its municipal waste from landfill by 2020. San Francisco leads the country in this endeavor, and in that regard has much to teach the rest of us. However, the film’s too sunny presentation of the City by the Bay’s recycling efforts to the near exclusion of ‘reducing’ and ‘reusing’ risks sending a message to consumers that could perversely result in more waste generation—and wasteful consumption, not less. 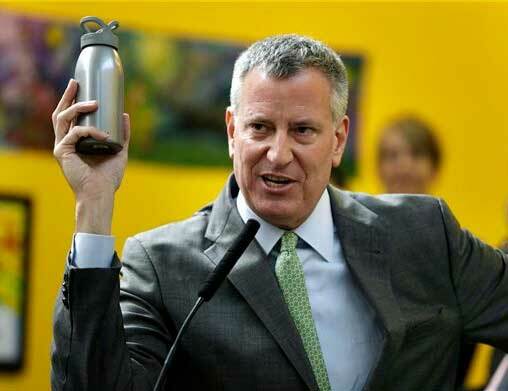 NYC Mayor Bill de Blasio with reusable bottle in hand, announcing NYC’s Zero Waste by 2030 Plan. So it was very exciting to see Mayor Bill de Blasio unveil on Earth Day his OneNYCPlan, with its goal of diverting from landfill 90% of NYC’s municipal waste by 2030. So I was quite interested to see ‘Racing to Zero’ when it was screened on May 28 as part of a fundraiser for local composting efforts by the Manhattan Solid Waste Advisory Board. This is a powerful premise, and one that needs to be embraced broadly in our society. To its credit, the film does a great job of explaining how San Francisco is able to divert laudably high levels of its waste from landfills and turn it into new products via recycling, or soil amendment (composting). However, in its zeal to get out its message, the film depicts recycling as a magic bullet, and as such risks a ‘Rebound Effect‘ if consumers start to view recycling as permission to continue to consume at the current rate, rather then change to less environmentally impactful forms of behavior. A seemingly simple sounding concept, recycling is fraught with complexity; any discussion of its merits needs to be balanced by a sober discussion of its limitations as well as its relationship to other, more environmentally preferable solutions to solid waste such as reducing and reusing. That said, not all materials can be physically recycled (due to difficulties separating for instance), or benefit from profitable markets that would warrant their collection. 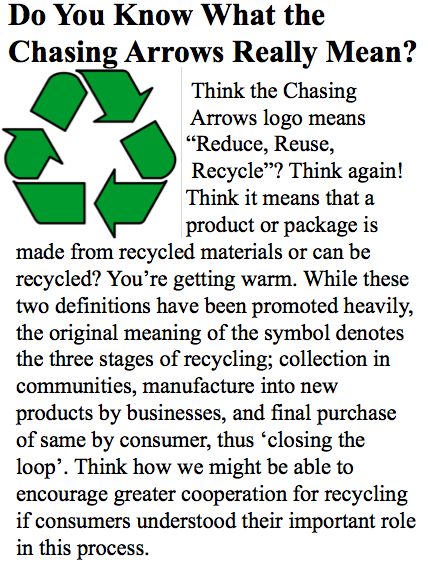 Contrary to the ’round and round’ image conveyed by the chasing arrows recycling logo (See side bar), not all materials can be recycled indefinitely; unlike glass or aluminum, paper fibers become shorter and weaker with each successive round of recycling, and eventually wind up in a landfill or compost pile. Most plastics, when they are collected at all — typically only #1’s (PET) and #2’s (HDPE) are collected in local communities – are simply ‘downcycled’ into lesser quality material. Finally, recycling has its own environmental impacts, starting with the energy (and resulting carbon emissions) it takes to transport recyclables from collection point to materials recovery facility (MRF) to eventual point of re-manufacture. So it is entirely possible that, from an environmental standpoint, products made from 30% recycled content could actually be environmentally as well as economically preferable to 100% recycled content. 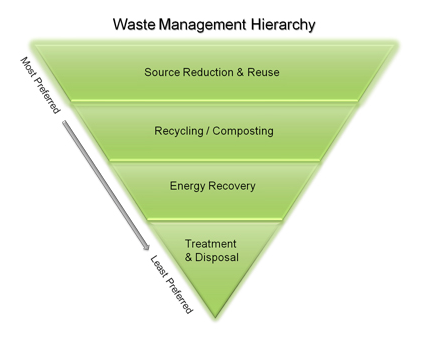 The EPA’s Solid Waste Hierarchy stresses source reduction and reuse over recycling. waste materials are directed to their highest and best use; this may include refilling some packages, for example, rather than simply sending them for recycling. Finally, according to the definition adopted by the Zero Waste International Alliance, and espoused by the U.S. Zero Waste Business Council and others, zero waste is about more than landfill diversion. It is about preventing waste from occurring in the first place by changing consumption culture with a prominent role for Reduce and Reuse, the two R’s that rank above Recycling in EPA’s Waste Management Hierarchy. ‘Racing to Zero’ has close to zero (couldn’t resist the pun) discussion of San Francisco’s efforts to promote these other 2 R’s ) by highlighting campaigns (which I presume exist) to encourage consumers to use refillable water bottles and coffee cups, bring their own bags to the supermarket, or shop in thrift stores, swap instead of buy new, or obtain used products via online platforms such as e-bay and Craig’s List. Composting does play a key role in ‘Racing to Zero’ (and is the ‘star’ of the film’s trailer), as it is considered to be a form of recycling, and its benefits are well displayed, although its treatment too could benefit from a more balanced discussion of alternative, environmentally preferable ways of disposing of food waste such as nourishment for humans and animals. Recycling Must Not Become an Excuse to Consume. Understanding why ‘Racing to Zero’ is so unbalanced is not germane to this article (although the film’s producer is listed as an ‘artist in residence’ at Recology, the City’s outsourced recycling organization, and Recology is listed as a Partner on the official website.) And I don’t mean to ‘shoot the messenger’. This film has much to teach about the potential value of recycling to shift perceptions of trash from ‘garbage’ to a ‘resource’. Given its single-minded focus on recycling, perhaps it would have been better titled along those lines rather than as a portrayal of San Francisco’s zero waste efforts with its multi-pronged approach. My main point is this: without a more concerted focus on Reduce and Reuse, together with a more balanced discussion of the effectiveness of recycling with the context of achieving Zero Waste, ‘Racing to Zero’ and any related communication by any other group to follow will lose an important opportunity to credibly educate the public at large and those of us in cities like my own about the role that recycling can play as an effective solid waste strategy. At worst, it risks sending a message to consumers that recycling is the new ‘away’, and that our throwaway culture can continue unabated. This is an important topic! Let’s discuss and debate this so that future readers may benefit. What do you think? Am I too harsh? Justified? What might this documentary have done differently? Do you know of any other documentaries that do a better job of explaining what it takes to get to Zero Waste? Wow, Jacquie. Nice critique. While I haven’t seen the film yet, isn’t what you describe greenwashing, in a sense? Thanks, Jenny for the compliment. I worked hard on this piece and tried to be fair. Though I’m sure you can detect an emotional chord here. I wouldn’t call this ‘greenwash’ per se, because that typically involves deception vis a vis claims intended to sell a product or portray a company’s green efforts in too favorable a light. I suspect this film is more likely a case of over-exuberance, ie., the team being a bit too ‘excited’ about the potential of recycling to turn garbage into a resource. At worst, it’s more of a well-intended form of propaganda rather than a true documentary. That’s my opinion. Thanks for the opportunity to express this. I have no significant problems with this final version. It makes the points that need to be made, while taking nothing away from San Francisco’s accomplishments, and suggesting (and implying) ways for NYC to build on that. It is very hierarchy-oriented, bringing us back to a previous era. But I guess that’s what hierarchies are for, and someone needs to “enforce” them. I noticed composting is placed within a new hierarchy, subservient to other uses of food waste. Again, not a big problem with that, unless it gets to a splitting hairs stage, hierarchy for the sake of hierarchy. Composting, as long as it’s effective, can be seen as source reduction as much as it’s recycling, begging the question what does it matter which one it is? You’re feeding the critters that feed us. So I wouldn’t overdo that hierarchy. Finally, if we’re going to urge—quite justifiably—a more critical treatment of even “motherhood” concepts like recycling, we need to be open to the same for reuse. There might be times (e.g. reuse of someone else’s prescriptions or other medical supplies) where we don’t want to do that. Same for source reduction, but I suspect, having just taught a course in Sustainable Consumption, that is a whole, much larger discussion. You’re right, Matt. We can’t get caught up toooo much in hierarchy. It should be a guide to decisionmaking, not a source of confusion or paralysis. As in many things, some action is better than no action! Recently (for a year now) I have been composting so there are 3 buckets under the sink- trash, recyclables, and food waste. I feel really bad that my recycle bin fills up almost every other day. It’s too much packaging and too much excess of the packaging as well. For example. A delivery place doesn’t just give 2-3 tissues for 2 meals. they give 10 tissues, 10 sets of plastic utensils etc.. I hear you loud and clear, Tamanna. We have a sense of abundance in this country — to excess. And when napkins, plastic utensils are cheap, the spigot is turned on high! I’m encouraged to see those bamboo cutlery sets now being sold. First we brought our own bag, now I for one, also pack the People Towel (which doubles as a fine napkin), and cutlery. It will be a matter of time when others will follow suit! I think this is a great post and has gotten a great conversation going. I couldn’t agree more with the opinions being expressed here! What really hits home for me here is the idea that so many people see recycling as the new ‘away.’ People look at plastic and other recyclables as the easy way out, or a guilt-free way to get rid of their garbage. But it doesn’t go away! I am a big proponent of reusables (as you can tell from my post about my reusable coffee mug). I think reuse might be my favorite of the three Rs because I love finding creative ways to reuse certain things for a different purpose than they were originally meant for. However, we have to to be wary of reusables too, because if we let them pile up, we have to think about where they go when we are eventually finished with them (or lose them)-5 reusable water bottles might outweigh the benefits! So, if we start by focusing on reducing consumption, we might be able to avoid some of these obstacles we run into with reusing and recycling altogether! I’m in full agreement that the celebration of recyclables and San Francisco’s ability to handle them still supports an “out of sight, out of mind” approach to waste. The film does a great job providing viewers access to the ins and outs of the city’s waste management. Aside from the insight on home compost piles, the entire process remains a distanced responsibility for someone else to handle–repurposing, reprocessing, etc. It would have been nice to see the filmmakers insert a plug for reducing and upcycling within the household. Spot on, Jacquie! 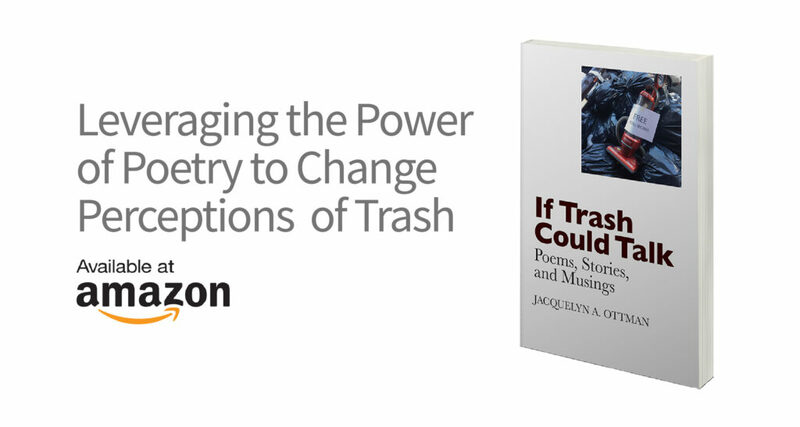 While shifting materials from landfill-bound garbage to recycling and composting has its merits, REDUCING the amount of trash we generate in the first place makes much more sense and should be emphasized in any educational or promotional program, not to mention public policy. To me, it’s as simple as “An ounce of prevention is worth a pound of cure.” The bottled water that I don’t buy, the plastic bag that I replace with my cloth tote, the leftover food that I eat the next day, the paper that I turn over and use for scrap…refusing, reducing and reusing all diminish the need for recycling, composting, disposal, etc. I’m not aware yet of any problems involving composting, although we are in the early period in which some mainstream participation my be starting. Perhaps some issues will emerge, or I’ve missed something beyond operational growing pains. I don’t see why we would want to “reduce…the need…” for it, or “reduce the total amount of solid waste we put in…compost pails…” At least at this point. Composting comes pretty close to, or hits, closed loop, and reminds us of our link to how nature works. Plus, I think it’s categorization within recycling is somewhat arbitrary. Great to see a focus on reduction. It’s always good to see a balanced view of waste, including possible negative impacts of even recycling. unfortunately, people seem to “tire” of recycling (when they know about it) and from what I’ve seen, there is inadequate simple training going on- municipalities, retailers, etc…- so there’s alot of materials going to disposal. It’ll be interesting to see the multifamily composting participation rate in NYC over the long term. It can be challenging enough in a suburban home w/ property. Not surprised that the NJ recycling has been languishing/decreasing. Enforcement ? hear of/see any ? Retailers may not always have effective (or in some cases, any) in-house recycling, despite state and local laws. The product packaging left after restocking, even after OCC is recycled, along with the pallet and other films, can make up a significant portion of disposed resources. Ever notice what goes into the single waste baskets at the Whole Foods cash registers (at least in the 1 store I noticed). While WF may have a great program, including composting, why not have it consistent storewide ? Kudos to the folks working to grow these efforts ! Matt – While I believe we should certainly follow the example of nature’s “waste=food” cycle, I trust there will always be enough leaves, corn husks, banana peels, coffee grounds, and manure to provide compost for those who use it to nourish and replenish the soil. But in nature the animals eat the food first, and then produce waste that can be returned to the soil. So I would try to reduce the amount of edible food that is wasted and sent directly to landfill or compost piles. Lots of posts on WHTW to help us do that! As the crazy-garbage-maniac in my San Francisco office and at home, I was interested to read your post. Not surprised the film focused on recycling — that’s Recology’s “business,” and what its artists-in-residence see in-action. (The recycling plant is awesome: visit it sometime.) But, yes, SF has initiatives to reduce the waste stream — we were the leaders in plastic bag bans (though plastic from grocery stores – for produce and the like – remains endless) and there are now bottle-refilling stations in some public places (most notably SF Airport) to help to reduce the appalling glut of plastic water bottles. SF Government I believe no longer allows money to be spent on those by departments; others may be getting the hint. Construction waste in SF must be massive, surely exceeding everything else. Most is surely recycled (it is cheaper to dispose of recyclables than landfill trash: money talks). Houses that change hands here are torn apart by new owners (after they’ve been staged with things like new carpeting that immediately gets trashed) – when buildings with decades of life left are reduced to bare framing there’s a huge environmental cost that is not accounted for. But that seems to be part of our culture, writ large in buildings, but small in habits of it’s-out-of-style-in-6-months fashion, and in the little things that build up like waste from buying one’s daily coffee, and even from making it at home if you must use one of those appallingly environmentally-unfriendly single-cup coffeemakers: let me introduce young readers to the only-$2.99 Melitta filter (https://shoponline.melitta.com/category/single-serve-pour-over-coffee-makers) that got many of us through college! So HOORAY for reminding everyone that REDUCE and REUSE are critical. (And, folks, I’ve moved and help someone else move – after decades in one house, and raising children there. You will be amazed. Yes, this takes more effort than tossing stuff in the garbage … and you do have to be alert for hoarders … but lots of opportunity to feel good about where your stuff goes. Pingback:	Recycling is good BUT behaviour change is what’s really needed. 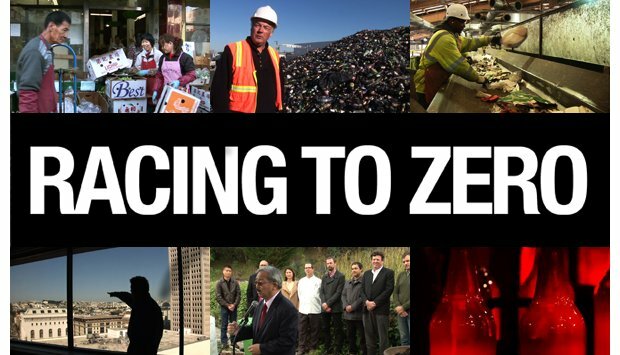 Thank you for your article about Racing to Zero: In Pursuit of Zero Waste. We welcome any and all discussion about how to formulate a national zero waste policy and achieve the goal of zero waste. Many thanks for taking the time to offer your comments and also for the additional comments from your readers. I hope this article brings more attention to your film. Thanks for the platform to start what I hope will be a continuing conversation on this site about the need to keep reducing and reuse in the forefront of solid waste solutions. Please keep us abreast, either online or offline, of further progress on your parts to continue to communicate San Francisco’s great progress in the race towards zero waste. I live in the Netherlands. We have lots of recycle programs here. We have options for paper, glass, batteries, textiles, cooking oil and plastics. And recently we are allowed to throw cans, foils and tetrapacks into the plastic recycling containers too. These plastic containers are large ones that are placed next to the ones for glass near supermarkets ( which are always overflowing). We do not have landfill here as far as I know ( our country is very small) but our rubbish is incinerated to produce energie. At home we have two bins. One for composables and one for other rubbish and some households have one for paper. We don’t but our paper is collected once a month by volunteers who sell it for charitiy. We also have a deposit system for PET bottles of one liter and over and would like to have the same for the smaller bottles but the industry doesn’t want this and is even trying to scrap the other one. I am very frugal, we never have takeouts or conveniace food and I usually go to shop at fleamarkets when I need to replace something. friendly than using virgin plastic. So now everything goes into the bin at home. We now have a full wheelybin every two weeks full of packaging ( remember, no takeaways, packaging from non food items, paper or glass etc.) whereas I used to feel good when putting my bag full of plastic into the big container I now feel guilty again when throwing the plastic in the bin. I find it really shocking how many products are now packaged in plastic when they used to be packaged in glass. I try to make the best choice when in the shop but one by one manufacturers are changing to plastic. We must cut down! I appreciate how you offer such a well-rounded overview of the subject. Many people do indeed forget – or do not like to be reminded – that the product has not yet truly been “dealt with” even after the garbage truck has passed and that taking the initiative of thinking about a product’s final destination before purchasing it is as important as putting things in the blue or green bin after usage. I have not seen all of the “Racing to Zero” documentary, but have watched an 8-minute excerpt and agree that, though informative, watching “Bag it” directed by Suzan Beraza and reading your article as complements would likely allow someone to more completely ensure that they have educated themselves on the importance of respecting all three R’s as individual and interconnected concepts as well as understand that recycling is – unfortunately – not a magical solution to preventing waste build-up, as you so properly remind. Recycling will never fully resolve our waste woes people because too many stars need to align for the process to work. The material has to be recyclable, which is no guarantee. Also, people have to understand what is and is not recyclable. Even a keen environmentalist can get confused, especially when different municipalities have different recycling capabilities. Recycling the wrong thing can contaminate the batch and do more harm then good. Another issue arises when consumers have recyclable waste and no recycling bin nearby! Finally, without a strong economic incentive to recapture these resources, recycling programs won’t sustain themselves long term. Reducing waste sidesteps all of these problems, relieves stress, and has a greater impact.